In Bengali's weekdays lunch menu fish has to be there. 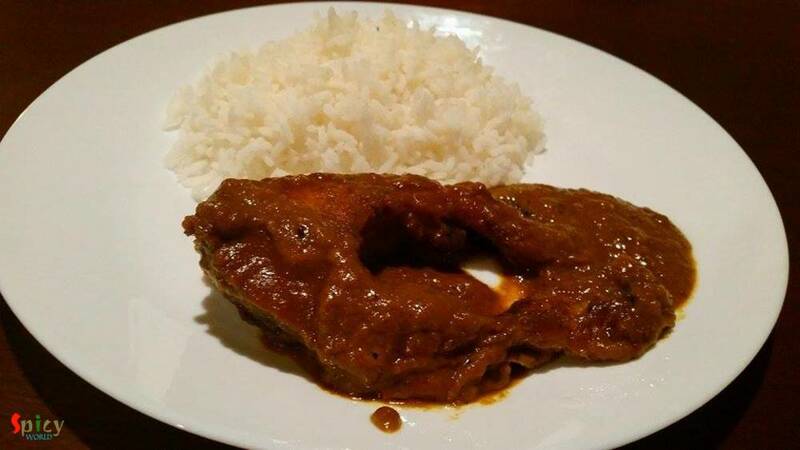 There is a say 'mache-bhate-bangali' indicates our common meal is fish curry and rice. This is a special dish for party, occasions or gatherings. Macher kaliya goes very well with sweet pulao, fried rice or even plain rice. Ginger and garlic paste 1 Teaspoon. Red chili powder 1 Teaspoon. Mustard oil 7 Teaspoons and Ghee 1 Teaspoon. Marinate the fish pieces with salt and 1 Teaspoon of turmeric powder for 20 minutes. Put the marinated fish pieces one by one and fry both side till it become red. Then keep aside. Make a paste of brown onion and hunk curd. In the same oil add bay leaf, green cardemom, cloves, cinnamon stick. Saute it for a minute. Then add the ginger and garlic paste. Fry it for 2 minutes. Then add the onion paste. Cook it for 10 minutes. Then add all mentioned spice powder, salt, sugar. Cook this for 6 minutes. Then add the fried fish pieces, green chili and some water. Cook the fish with gravy for another 10 minutes. Turn off your gas and add 1 Teaspoon ghee on top.